One couple and two boats, one to live on and one to work from. 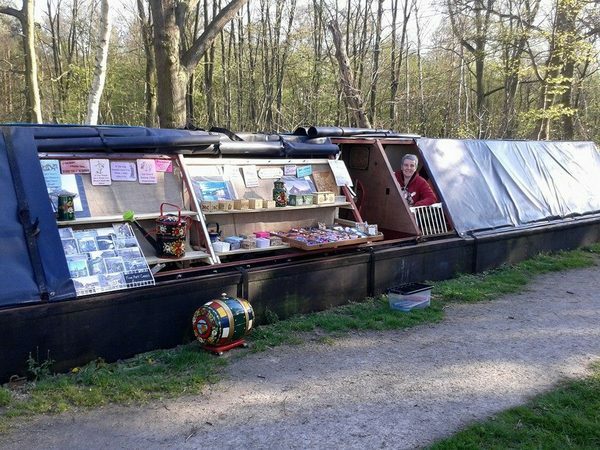 Alison and Louise earn a living from their floating home in the centre of Birmingham. 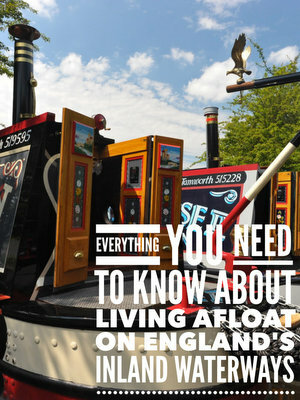 The location isn’t everyone’s idea of an idyllic mooring but they are more than happy with it. Alison Tuck Married to Louise Moore (canalartist) we have two dogs Harvey and Squash both rescues staffie cross. I was a senior design engineer working for many of the large Car Companies designing window seals, door lock systems, seats etc. Working in the Computer Aided Design sector. Took me all over the world. I got fed up of the travel and long hours so came up with Davinci crafts. It allows me to live and work on the canals. While still doing what I love which is design and engineering. Met Louise at Uni and we’ve been together ever since (21 years). Louise is a fine artist and works from the boats she also is a director of a Fine Art Company manufacturing Artists Canvases and has a fine art shop in Birmingham. We moved on 11 years ago, After Louise lost both her Parents. It was the inheritance money that enabled us to start a Life afloat which was Louise’s dream not mine. I soon fell in love with it too. We have two NB DaVinci (our home named after leonardo Davinci who was an artist and engineer! not the bloody DaVinci Code!!! lol) and Butty Lowry (our workshop for Davinci Crafts). Lowry is a cut and shut half bantock and we think old BW hopper. So Lowry being an industrial Artist seem apt! I have a commercial mooring at Warwick Bar in Birmingham Digbeth Branch of the GU. I can trade as a shop on site from Lowry (DaVinci Crafts) We have permission to reside at the moorings for 8 months. Which suits because we travel around in the summer Trading from the towpath. Grumpy boaters who are in a rush!! The freedom that you get from societal norms. Watching the wood burner and being warm and cosy in the winter. cant think of anything as just re modelled and decorated so happy. Walk, cycle or get Tesco’s to deliver to a local pub. composter, very happy no stress about finding an elsan or being full as it goes in the bin! Roasting! I cant stand being cold. Work out what suits you and the way you want to live. There are loads of different solutions on offer so don’t listen to everyone else because there solution is what suits them. And definitely Hire a narrowboat and spend a couple of weeks on it in the winter because this is the most difficult time of year on the towpath and you will quickly learn what you need and don’t need.